So Many Stamps So Little Time: Just For You! Hello! 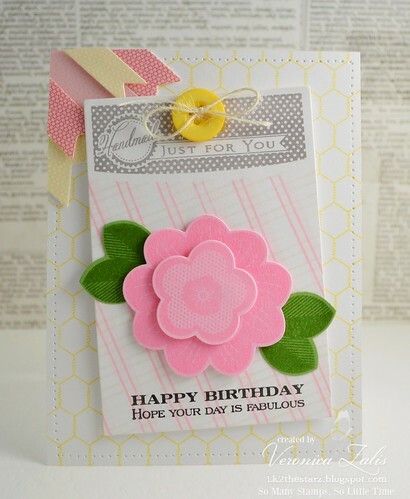 Today I am excited to be playing along with two of my favorite challenges, Moxie Fab World: Tuesday Trigger, and this weeks Papertrey Ink: Make It Monday. To create my card I used lots of Papertrey Ink goodness! Ruby Rose, Farm and Barn, Boutique Borders: Birthday, and Boutique Borders: Accessories. I also used the matching die for the BB Accessories set, and Ruby Rose. I used Stampin Up Wild Wasabi, Pretty In Pink, and Barely Banana. And A Muse Studio pigment ink colors Pebble, and Shell. My flagged border is from a DCWV Spring paper pad. I think I captured the folksy, soft, floral loveliness of the Tuesday Trigger picture. I would love to have a room just like that one! I loved making this card, and I hope you like it! So pretty. Love those banners in the corner!! This looks like a winner for sure! So original, trendy. pretty and totally awesome! You should have submitted this for publication! Ps: I love your blog banner! Oh my golly, you just rocked both challenges! Lovin' every detail, especially those trimmed flags. I LOVE your card! So very pretty! Adorable card! Love the pennants in the corner and that cheery yellow button! Lovely take on the trigger! Veronica, this is super pretty! Love your bright pink flower! What a cute, cheerful card! Love the topper piece. Your blog header photo is really cool too. Veronica, this is so pretty! Gorgeous card!